And while Dr. Ogg refers to Nebraska, the content applies equally well here in Ontario. “How can I get rid of ants in my house?” . . . . .is one of the most common homeowner complaints heard by insect pest control specialists. They invade the home to forage for food or seek shelter or both. This article explains ant behavior and provides control tips so you, the homeowner, are better equipped to deal with this pest. All ants live in colonies, consisting of an egg-laying female (queen), short-lived males, and workers (sterile females). The ants you see foraging in your garden or kitchen are workers. Workers that find food communicate with other workers by depositing a chemical message on the substrate as they crawl back to the nest. Although we cannot smell it, this “trail pheromone” sticks to the substrate for long periods of time and helps other ants find the food at the end of the trail. Termites also develop wings and swarm during the spring and look similar to flying ants. Examine them closely to make sure that you have the correct pest! Ants are thin-waisted and have elbowed antennae. Termites have thicker waists and have antennae that resemble strings of tiny beads. You may need a magnifying glass to examine antennal features. As a group, ants have a wide food range, feeding on sweet foods, greasy materials, starchy substances, wood, and all kinds of plant and animal materials. Part of the reason that these insects become a nuisance in our homes is that they often like the same kinds of food that we do. There are two categories of ants that will be encountered when experiencing a problem with these insects. The control strategy that you should take depends on your type of infestation. Ants that live outside and forage in the home. First, cracks and crevices should be sealed to eliminate passages into the home. If you do not seal entry points, ants will probably find their way into your house at some later time. Second, scrub around entry points with a detergent (to remove the trail pheromone) and spray a residual insecticide around entry points. Bait treatments and insecticides can be used to control ants in the outside nest. To be effective baits must be placed in areas where ants frequent, eaten and be taken back to the nest. There are several different kinds of baits available, and you may have to do a little trial-and-error to find the proper bait. Because they must get back to the nest for satisfactory control this strategy may be incompatible with insecticide sprays which may kill worker ants before they can get back to the nest with the bait. The successful use of a bait may take several weeks or more. Insecticide dilutions can be used outside to successfully drench nests. Be sure to follow label recommendations for correct procedures when applying the insecticide. Ants that live (nest) inside your home. Yes, there are some types of ants that actually establish a nest inside your home instead of merely entering to forage for food and returning outdoors. Ants in this category may be present year round, although they will be more active in the warmer months. 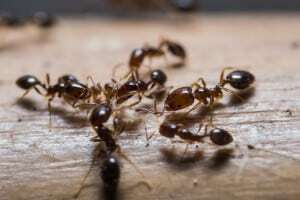 Ant species that may live in Nebraska homes include crazy ants, odorous house ants, pavement ants, pharaoh ants, thief ants, and carpenter ants. All of them may infest food products. Spraying a residual insecticide to control foraging workers may provide only short-term control. Even when over 99 percent of foraging workers are killed by insecticide sprays, the colony may rebuild to its original numbers. Location and total destruction of the nest is the most direct way to eliminate this infestation. Ant baits, described above, can again be a useful tool in eradicating inside-the-home ant nests, although baits may not work as well with carpenter ants as the other species mentioned. Again, workers must eat the bait, take it back to the nest, and feed to the queen and larval ants. This type of control is incompatible with treatments that prevent workers from returning to the nest with the bait. Unlike other home-inhabiting ants, carpenter ants cause structural damage to wood by tunnelling and nesting inside wood structures. However, they rarely nest in sound wood, but consistently invade wood that has become wet and started to decay. Carpenter ants are large (about 3/8 to 1/2″ long) and black or red. The best way to control carpenter ants that inhabit a dwelling is to find the nest and destroy it. Insecticide sprays inside the home will kill some of the worker ants, but unless the entire nest is treated, the queen will continue to produce additional members of the colony. Locating a nest can be difficult because nests may be in locations within the walls or roof rafters. 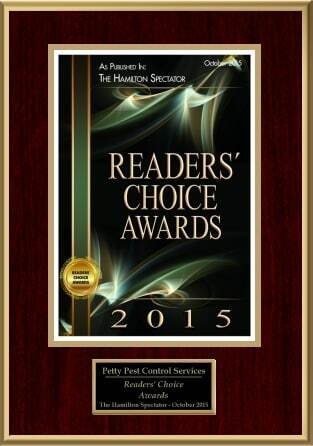 At this point, some homeowners may prefer to work with a professional pest control company. The most likely places to find carpenter ant nests are where wood has been wet and weathered, such as rotting timbers about the foundation, window sills, porches, around leaky plumbing, and in rafters under a leaky roof. Carpenter ants are most active in the evening hours foraging for all kinds of food, both inside the house and outside. By following them, you may be able to tell where the nest is. Because carpenter ants keep the tunnelled galleries very clean and push the sawdust and dead insect parts out small holes in the wood, a small, fresh pile of sawdust under the nest timber is the usual sign of an active carpenter ant nest. Once a nest is found, treatment is usually easy with either an insecticide dust or spray. Injection of insecticide into wall voids or the nest itself may be necessary to insure complete control. Ants are a major annoyance to homeowners and are difficult to control. You should not underestimate the importance of good sanitation to eliminate food sources, although good sanitation may not control an ant infestation by itself. Although we do not like sharing our homes with these insects, they are beneficial organisms in the balance of nature. In nature, they greatly reduce the amount of dead and decaying plant and animal organic matter. They also aerate the soil with their nests. Many ant species have a fondness for honeydew that aphids produce from feeding on plants. Large numbers of ants crawling on a plant may be a sign of serious aphid infestation. Ant infestations are not easy to control and different strategies should be used depending on nest location and food preferences. They can be controlled with a combination of good sanitation, removing pheromone trails, caulking entry points and eliminating active nests. Insecticide sprays and baits can be used to kill foraging ants and destroy nests, but strategies designed to prevent further infestations should be used in conjunction with chemical treatment. Petty Pest Control Services can provide households with ant extermination and ant control services in Toronto, Hamilton, Mississauga and the Niagara region in Ontario. We service; Hamilton, Toronto, Mississauga, Oakville, Guelph, Kitchener- Waterloo, St. Catharine’s, Niagara Falls, Niagara-on-the-Lake, Fort Erie and Simcoe. We also provide immediate emergency services anytime 24-7.